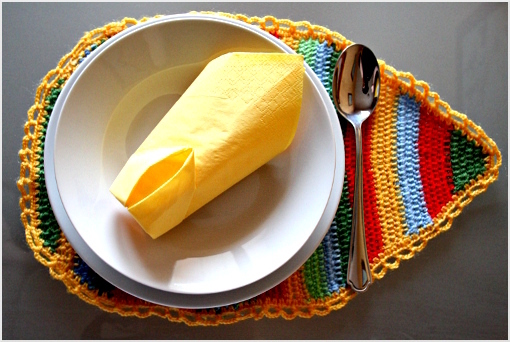 Anyway, I’ve just finished crocheting this placemat. 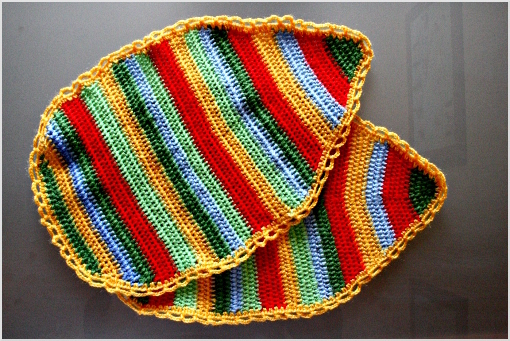 More precisely, it is an Easter placemat (… and I only hope it resembles an egg). And yes, there are two of them… because there are two of us who share the table. Nevertheless, I think he is slowly getting used to my colorful Spring ‘n Easter worshiping mania. In case someone arrives to visit, they will have to dine like this too – no matter how hard they might fight, kick or scream – there’s just no way to escape my Easter placemats. If you feel like it, you can make these cuties too. I’ve prepared the pattern for you. It’s quite easy and it will provide you with the sweet, precious time to relax and watch you favorite programs without feeling guilty for just sitting and staring at the TV screen (whoops… somebody has just revealed her huge secret… many Martha Stewart shows have been watched here recently). That is so coooollll. I really like it. Well done, great idea. Love the colors! Beatiful setting! I really love the edges, such a nice touch. Hello there, Happy Easter 2010!! Happy Easter to you as well, dear Deanna! 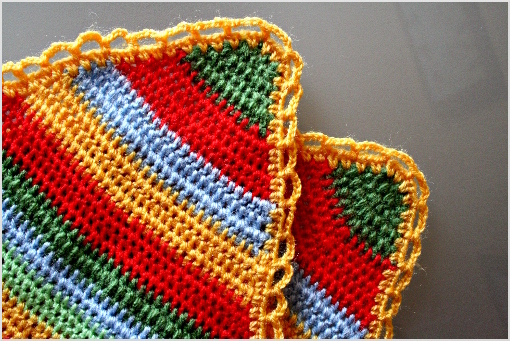 what crochet hook do you use for the easter placemat pattern, I really love it and like to make at lease two of them. Hi Janet! I used 4 mm (G) hook here. 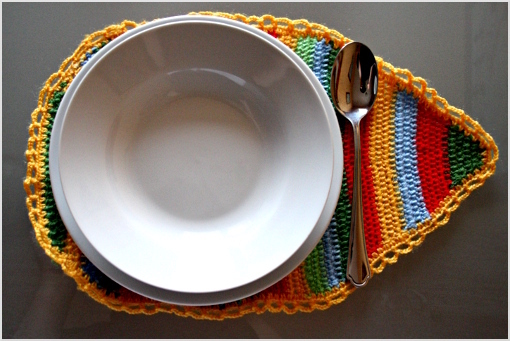 I was searching for placemats that I can crochet for the season, and found yours. Very creative! 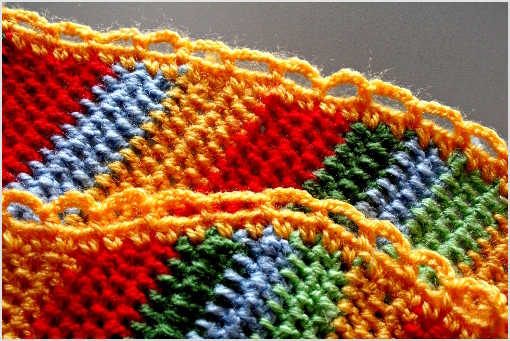 What type of yarn do you use. Or do you use thread? 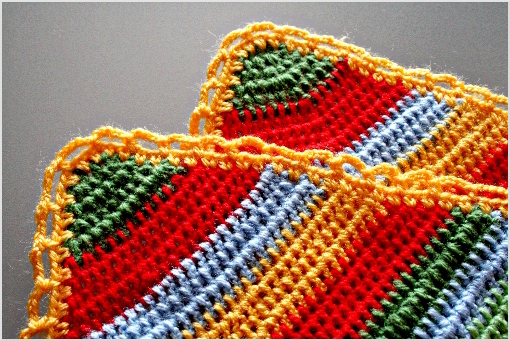 Thanks for sharing the pattern for free. NOTE: Was a bit of a bear printing it because of the layout. I couldn’t cut and paste, so I did a screen print. Perhaps you could find a way to make it printable? Just a thought. Happy Spring!! 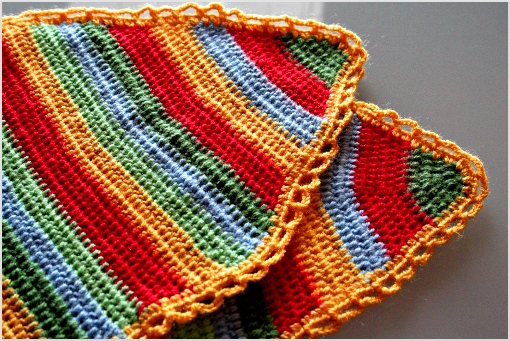 Maybe one day you’ll need to make a couple more when the household gets a little bigger?